I'm a coffee person in the mornings, but if I want something later in the day, I love a nice comforting cup of tea. I was recently drinking some tea when I opened an email asking me if I'd like to check out Buddha Teas and give them a try. I'd never heard of them before - perhaps you haven't either - but I checked out their web page and replied that I was very happy to try them. Buddha Teas come in many different varieties and all are 100% unaltered, organic teas made from the freshest herbs, carefully packaged in bleach free tea bags. They really understand the importance of purity so that the true flavor of the tea comes through and that a cup of tea doesn’t contain any harmful additives or toxins. As I was reading through all the benefits each of the types of tea can have - detoxification, energy, brain function, immune support, digestive support, to name a few - it really hit me how important it is to have the purest herbs without any added toxins. For some reason I had never given much thought to the tea I drink beyond choosing a flavor that sounded good. (Maybe I should go read the labels on all my tea boxes?) Seriously, if I'm going to be drinking herbal tea, shouldn't I want all of the positive benefits I can get without adding anything that would counteract that? I decided to try as many different types of teas as I could - Leaf Tea, Root Tea, Flower Tea, Bark Tea, Berry Tea - and I ordered a couple of the Specialty Blends, too. I have been enjoying all of them, but I think my favorite is the Zenergy Blend. It's a nice pick-me-up in the middle of the afternoon. The single herb teas are all good, and I find them very mild and enjoyable, too. Most of the time I add a bit of honey and a squeeze of lemon. The only thing I don't really like about these teas is that, once you get them out of the box, you can't tell them apart. Each tea bag is individually wrapped, which is nice - but nowhere does it say what kind of tea is inside the wrapper. The tag on the teabag itself isn't labeled either. I didn't notice this until I pulled a few teabags - from a couple different boxes - to take with me on a trip. I got ready to pack them and then looked at them and realized there was no way to tell which tea was which. So, when you get these teas, you'll want to keep them in their own boxes - or forever be (pleasantly) surprised when you brew your tea. The boxes really are kinda cute, and made from recycled materials. I have a nice stack of them on my kitchen counter. 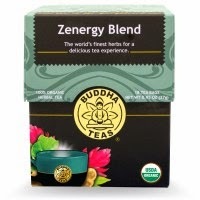 If you're looking for high quality organic teas, be sure to check out Buddha Teas. Receive an additional 5% off when you use coupon code TODAY at checkout. I was provided with these teas from Buddha Teas in exchange for my honest opinion and review.